In Part 3 of this series, we will focus on the fundamentals of pavement design and also introduce a number of specific strategies and technologies that GRT has developed as tools for mines to more easily achieve these required outcomes. Pavements are built on the local, in-situ soils that can present different properties and resistances. Soil with low resistance, as determined by CBR test, will present greater deformations when the load is applied and can lead to rupture. The pavement aims to prevent subgrade from this rupture with structural layers that reduce compressive stresses to an admissible value. Planning for building and pavement design involves soil analysis, which aims to determine its resistance. Soil with high resistance values usually don’t require excessive structural layers to protect soil from mining vehicles, however it is still necessary to fill with select materials to form the correct alignment and allow drainage. Subgrades with high clay content require more protection and, in some situations, it is necessary to remove unsuitable soils, which aims to reduce the required base thickness. If the CBR is less than 2%, or has a high moisture content, it is often necessary to remove the soil completely to a depth where a stronger material is found and to install drainage. Building on weak soil conditions is therefore very expensive (but often unavoidable), due to requirement for large quantities of materials with greater resistance to structural layer. Base and subbase layers consist of good quality materials with high resistance values and less than 20% fine materials. The particle size must be selected to allow good compaction, otherwise an area of uncompacted material may form within the layer. The choice of materials depends on the quality, availability and cost analysis. Locations with less available good quality material can use soil stabilisation as a way to reach the required strength, reducing the layer thickness and consequently reducing the cost of construction. Engineering plays a key role in identifying and overcoming such problems. 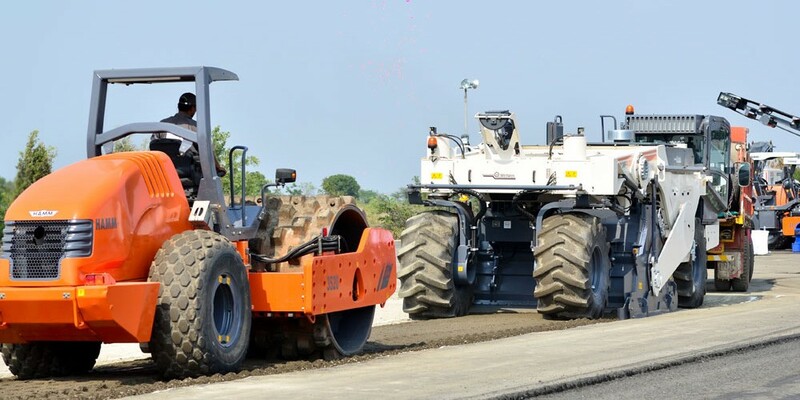 Stabilisation using GRT9000 or GRT:PCM will improve the compressive and tensile strength of materials, allowing engineers to reduce layer thickness due to the improvement of the resistance and layer resilient modulus, making the road more durable and economically viable. The wearing course of a haul road is typically the unsealed surface of the pavement material. Due to the massive loadings, damaging movement types, and presence of tracked machinery, bitumen and asphalt wearing courses are not viable. Smart material choice can help to ensure the required performance and decrease the rolling resistance of the vehicles. The selected materials must be resistant to traffic and also erosion, generally with CBR upper than 80%. Improper selection of materials may result in a slippery and unbound layer with potholes and corrugations that increase the rolling resistance. “Micro-stabilisation” using GRT9000 with a GRT7000 polymer seal to prevent water ingress, improve skid resistance, and maintain a dust-free wearing course is a cost effective and straight forward way to achieve high quality haul roads. This strategy will practically eliminate the occurrence of potholes, corrugations and others surface distresses providing a stable surface with reduced rolling resistance. Each year it becomes more economical due to the accumulative residual nature of the product, which reduces the required application rate and is environmentally friendly. Where this is not possible, the high amount of fine materials in the top layer will generate dust, which is a visual, as well as chronic respiratory health hazard. GRT: Haul-loc is a product specifically designed for mining conditions, which assist the preservation of good road conditions and is easily applied over the surface using water trucks. GRT: Haul-loc is a cost effective, water saving product that can improve the effectiveness of traditional techniques such as watering by 800%. It is an easy way for established mines to reduce costs associated with dust control and improves safety on the haul road network. Another dust control technology with application in mine pavements GRT has developed is GRT: Wet-Loc, a completely waterless, delivering results lasting 6 to 12 months, GRT: Wet-Loc can handle any traffic type and volume. It is a clear, ultra safe synthetic fluid that can eliminate the need for water from road maintenance and dust control activities. Because it holds moisture (but not water), it maintains the fines where they need to be – leading to greatly improved pavement cohesion. This prevents airborne dust being generated and also the development of surface corrugation and potholing thereby greatly reducing the need for maintenance grading. The use of GRT products and associated processes for stabilisation, sealing and dust control assists mine managers and engineers to keep site roads in good condition, whilst also driving better productivity, improving environmental sustainability, and reducing the risk of haul road safety incidents.